The categories of Tawheed were not something invented from the minds of the scholars rather, they were derived from proofs and evidence, established from the Qur’an and the Sunnah. This leads us to the next chapter, where Shaykh al-Fawzān (may Allah preserve him) discusses the affair of Tawheed as understood by Mutakallimeen, i.e. Tawheed in the mindset of the rationalists who refer their affairs back to logic and to their own reasoning and intellect, and the Sufis, the Ash’arees and so on. So Tawheed from the viewpoint of these “rationalists” is a singular category only and that is Tawheed ar Rubboobiyyah, the Tawheed of Allah’s Lordship only. Tawheed ar Rubboobiyyah is to affirm that Allah (ﷻ) is Al-Khāliq, Al-Rāziq, Al-Muhyi, Al-Mumeet, i.e. that He is the Creator, the Provider, the Giver of Life, the Giver of Death, that which refers to the actions of Allah. The scholars of Kalām (theological rhetoric), all of the scholars who described themselves as “rationalists” and their counterparts have founded their Aqeedah upon this so-called “logic and intellect”; meaning that they establish their religion and their belief based on what their mind and what their reason dictates, and this ideology is present to this day. In their books, you will only find the affirmation of the Tawheed ar-Rubboobiyyah. According to them, whoever believes and affirms that Allah is the Creator, the Sustainer, the Giver of Life, the Giver of Death, the one who created the heavens and the earth, is a Muwahhid, i.e. that he is a person of Tawheed (monotheism). In their viewpoint, there is no such thing Tawheed al-Uloohiyyah or Tawheed al-Asmā was-Sifāt – there is no Tawheed of singling out Allah alone as the sole deity worthy of worship, or to single out Allah alone with His beautiful names and His lofty attributes. They do not see a need for it, and therefore do not affirm those two categories of Tawheed. Therefore, it stands to reason that they do not consider the worship of the deceased in the graves, seeking intercession through them and supplicating to them as shirk (polytheism). Some of them say that this is merely addressing, talking to or calling upon other than Allah (ﷻ). Others of them may admit it is wrong, but they will not call it is Shirk (polytheism). So they do not see it as a violation of Tawheed. Others of them claim that these people who call upon the dead in their graves with supplications and seeking rescue with them that they are not Mushrikeen (polytheists) because they have not denied the category of Tawheed Ar-Rubboobiyyah. This is because Tawheed, to them, is merely one category and so long as a person affirms that Allah is the Creator, the Sustainer, the Giver of Life, the Giver of Death, the one who controls the universe, so long as a person affirms that then he is a monotheist, a Muwahhid. So since those who go to graves and make du’ā to them and call out to them do not believe that the deceased are the creators or the givers of provision, or that they control the universe alongside Allah, then in their view, it is not shirk to ‘merely’ call upon them. Instead, they believe that those they are worshipping in the graves are only a means of nearness, merely wasā’il (a means to reach Allah) and they are wasā’it (intermediaries) between them and Allah. When the Prophet (ﷺ) used to invite them to “Call upon Allah, don’t call upon the idols”, then it was not that they did not believe that Allah was the Creator and the Sustainer, they believed that Allah was the Creator and the Sustainer, the Giver of Life and the Giver of Death, the One who sends rain down from the sky and who brings out the provisions of the earth – they affirmed all of that. But they called upon the idols claiming, “We do not worship them [meaning the idols] except that they bring us closer to Allah in rank”. They worshipped the creation instead of Allah or called upon the dead or the Jinn or the idols alongside Allah. Those beings that they worship cannot harm them; nor can they bring them benefit, and they claim, “We are only calling upon them because they are between us and Allah, so they will bring us closer to Allah.” They did not want to call upon Allah directly, so they called upon idols, or the inhabitants of the graves, or the Prophets, or the Messengers, or they would call upon the jinn or the angels, and they used to say, as they say today, “They are intercessors between us and Allah”. This is something that is a reality and something that it present even in our times. 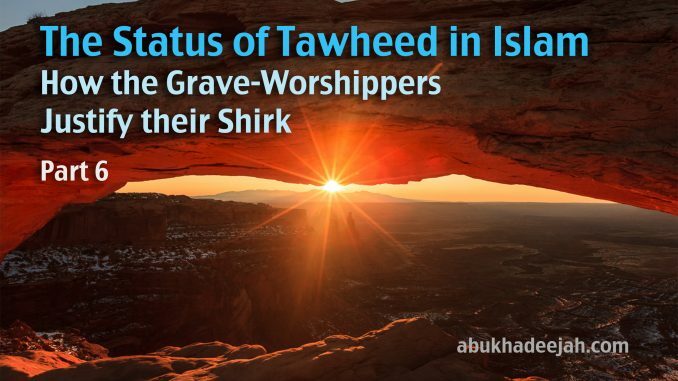 The heads of Sufism and theological rhetoric (the Ash’arees and Mātureedees) say that “Indeed, the supplication to the deceased in his grave and having this connection with and seeking rescue with them and seeking from them to intercede is not Shirk.” They claim that this is tawassul, i.e. this is nothing but seeking nearness to Allah and it is only seeking intercession (shafā’ah) with Allah; calling upon someone who will call upon Allah for them! They take the “saints” and “peers” and the awliyā as intermediaries between them and Allah (the Most High), whilst Allah has forbidden them from calling upon those who cannot benefit them nor harm them. So, they assert this is not Shirk because they believe that the ones they are calling upon (in their graves) do not create or provide and they do not control the universe, only Allah does that. Tawheed, to them, is merely the affirmation of the Tawheed of Lordship. They claim what they do at the graves is not considered to be Shirk unless one believes that the inhabitants of the graves and other than them have the ability to create, to provide sustenance and to control the affairs of the universe alongside Allah. If that was said, then that is Shirk, but other than that, there is no other type of shirk. This is something that they state clearly in their books and in their lectures. If one from the people of Kalām (among the Ash’arees and Jahmees) forbade this type of seeking intercession, they would only go as far as to say, “It’s a mistake, and they do not know.” But they will not say, “It is major Shirk“ because of their belief that Shirk is to deny that Allah is the Creator – and to call upon other than Allah is not Shirk. Due to this, most of them do not forbid their followers from travelling to graves and performing rituals and celebrations at “shrines”. They say this is merely the taking of intermediaries and intercessors to come closer to Allah, and not Shirk. Shaykh Al-Fawzan then stated, “By Allah, I have not ascribed anything to the people that they themselves have not said”, meaning, “I am not putting words into their mouths”. This belief is present in their books, and their speech, in which they refute the people of Tawheed and they defend the people of Shirk. They defend what is done at the graves such as Tawāf, prostration, bowing, raising hands in supplication calling out the name of the deceased in his grave seeking his aid or his intercession, and when it is asked of them “What are you doing? This is major Shirk!” They say, “No, it is not Shirk because we did not say that the dead one created us. We know Allah created us. The dead one did not create us, so how can it be Shirk?” So Shirk to them is only a violation of the Ruboobiyyah (the Lordship) of Allah, and they believe the Lord can be approached through the intercession of the dead, and the Jinn, etc. As for violating the Tawheed of Allah in His worship (‘uloohiyyah), they do not consider that to be Shirk. This is why you find them in their millions visiting the graves of the dead – they seek their aid and assistance and intercession (shafā’ah) and they do not consider that to be Shirk. That is a calamity because they have not understood the Tawheed that the Messengers came with. Lessons from the Noble Qur’an by Shaykh Sālih al-Fawzān (adapted).